It’s here! Volvo S90 sedans are striking to look at with all the curves in the right places, plenty of sensual materials and stunning technology. A new Volvo S90 Diesel sedan has to be one of the intelligent present day choices for a large, luxurious and safe sedan. Where the diesel engines shine are in grunt and fuel efficiency. Volvo safety features include the very best available, so when you add up all the pluses, the new S90 is a new benchmark in large luxury sedans. Volvo S90 sedans offer petrol and diesel engines. The diesel models come with a choice of two premium engines. The D4 uses a four-cylinder twin turbo-charged diesel engine that relays the engine torque via an advanced eight-speed automatic gearbox to the front wheels. Equipped with 140 kW of power at 4250 rpm and 400 Nm of torque between 1750-and-2500 rpm, the D4 Volvo S90 is a class leader offering plenty of punch, quietness and efficiency with a ride quality that is second to none. For even more muscle, the 2.0-litre, four-cylinder twin turbo-charged unit has been uprated in the D5 model. 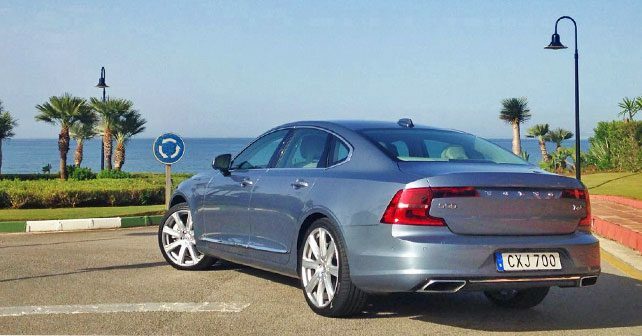 Equipped with 173 kW of power at 4000 rpm and 480 Nm of torque between 1750-and-2250 rpm, the D5 Volvo S90 Diesel Sedan is quick, relaxed and very desirable. The D5 engine encloses “PowerPulse” technology into the four-cylinder turbodiesel design. Volvo has placed a tank of compressed air that is deployed when the driver accelerates on the throttle. Activation of the compressed air causes the turbocharger to spin faster than the combustion of exhaust gases. The result is that turbo lag has been eradicated. Big and comfortable has its boons, and you’ll find that the cabin space is excellent. Not such a boon is the volume of luggage space in the boot – just 500-litres of luggage space is available, and it is, perhaps, the one area that isn’t quite as good as some other large luxury flagship models offer. However, you can fit a fair bit of stuff inside the S90 trunk. The boot lid comes with automatic opening, and so will detect a foot that’s waved beneath the rear bumper to open – a great feature when you happen to have an arm load of shopping to put inside the boot space. Weighing over two tonnes, the Volvo S90 Diesel sedans are weighty; however, the level of equipment inside one of these is amazing – it really is loaded. The aluminium strip that runs along the lower edge of the instrument panel looks appealing, but it also acts as a structural element that supports the whole instrument panel assembly. 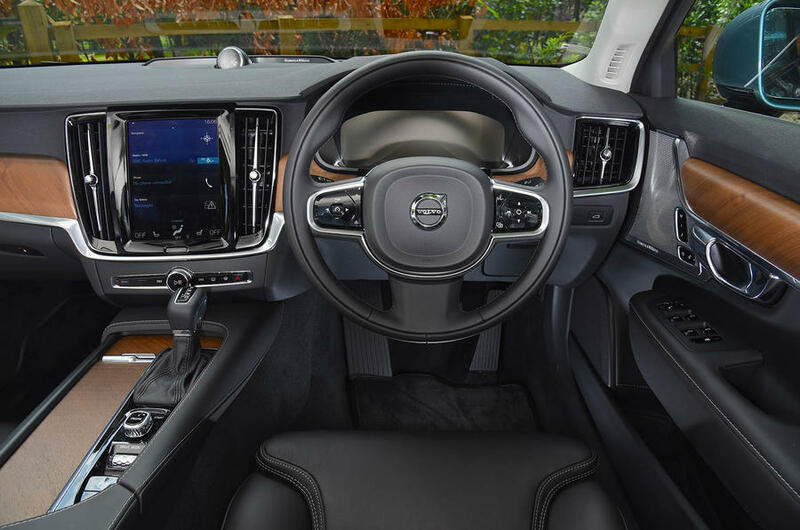 What makes the Volvo S90 interior so attractive is the modern style and lack of buttons. Most of the functions, including navigation, audio, climate control, and vehicle settings, are controlled by the 9-inch, portrait-format touchscreen at the centre of the dash. The touchscreen is very intuitive and easy to use. Sound systems in the S90 sedans are excellent, pushing for beast in-car sound as standard. 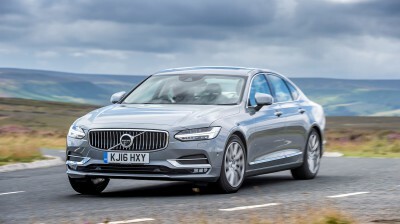 Volvo has created the classy S90 Diesel sedans with loads of torque and a very classy and dynamic chassis that rides the roads with real composure. Because there is plenty of power, the vehicle is smooth and quiet. 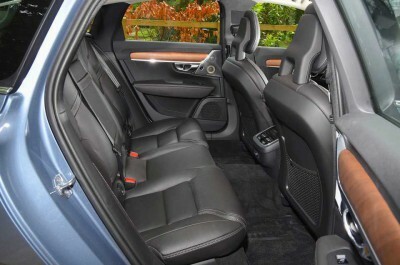 Ride quality is very good, and the seats are superbly comfortable and very hard to beat. The combination of style, comfort and stability makes the driving experience first rate for driver and occupants. This is a luxury sedan that all the occupants will love to journey in. There’s plenty to explore and enjoy from a driving enthusiast’s mind-set, while the travel experience is relaxed and very comfortable from an occupant’s point of view. I couldn’t right this review without mentioning anything to do with safety, because Volvo manufacturers have one of the most dedicated teams when it comes to things related to safety design. The new Volvo S90 Diesel Sedan comes standard with so many awesome safety features to make it brilliantly strong and safe. Adaptive Cruise Control makes sure your car keeps the right distance to the car in front. It certainly becomes really handy when you get into congested city streets. As the driver, you can see obstacles at any angle thanks to a 360 degree camera – parking couldn’t be easier – well, actually, add to the 360 degree camera the neat Activate Park Assist Pilot system, and you can pull up to any vacant parking space completely relaxed and in control because the car steers itself into the car park. Active High Beam automatically senses other vehicles, pedestrians and cyclists and will temporarily dim your high beam until the object or objects have passed. Volvos now come with a Lane Keeping Aid, assisting you in keeping inside your own lane. If your car starts to veer out of its lane, the system gently steers you back and sends warning vibrations to keep you alert. Pedestrian detection perceives people walking outside your vehicle, braking appropriately should the situation require it. If a cyclist swerves in front of your car, cyclist detection will warn you with a light on your windscreen and brake for you if quick action is necessary. Forward Collision Warning scans all objects within 150 meters in front of your car and if an accident is imminent, it warns you and pre-charges the brakes for a quick stop. This is awesome technology, and really goes a long way to eliminating all the common place accidents that could, at worst, take a life. The Pedestrian Airbag—a Volvo-first technology—automatically releases to cover the windscreen and lessen the impact of a stray pedestrian. What the all-new Volvo S90 carries is a ground-breaking design that sets it apart from other luxury marques. This new Volvo sedan is a luxury car, a genuine alternative to the Mercedes-Benz E-Class, BMW 5 Series, Audi A6, Jaguar XF and Lexus GS. I think it’s better than the other Europeans in the bunch, and as complete as the Lexus GS. There are quicker, sportier cars in the segment. But none rides and handles with the acutely satisfying composure of this big Volvo sedan. The S90 sedan is unfazed by nasty mid-corner bumps, effortlessly holding its line. Enjoyable and satisfying, that’s what the Volvo S90 is. Enter the new Volvo S90 D4 and D5, and the breath-taking interior design is now the luxury class yardstick. 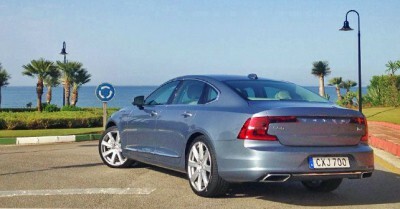 If you can manage it, get yourself into one of these and appreciate Volvo’s S90 luxury ride. For any more information on the Volvo S90 Diesel sedan or, for that matter, any other new car, contact one of our friendly consultants on 1300 303 181. If you’d like some fleet discount pricing (yes even for private buyers! ), we can submit vehicle quote requests out to our national network of Volvo dealers and come back with pricing within 24 hours. Private Fleet – car buying made easy!